August 9 is Book Lovers’ Day! For your reading enjoyment, we’ve put together a handful of some bicycle-related books for you to kick back with after you’ve finished your ride. Books are listed in alphabetical order by title. All links (except where noted) are to the books’ pages on Amazon. If you decide to purchase through Amazon, please log into smile.amazon.com and choose BikeTexas (Texas Bicycle Coalition) as your beneficiary. 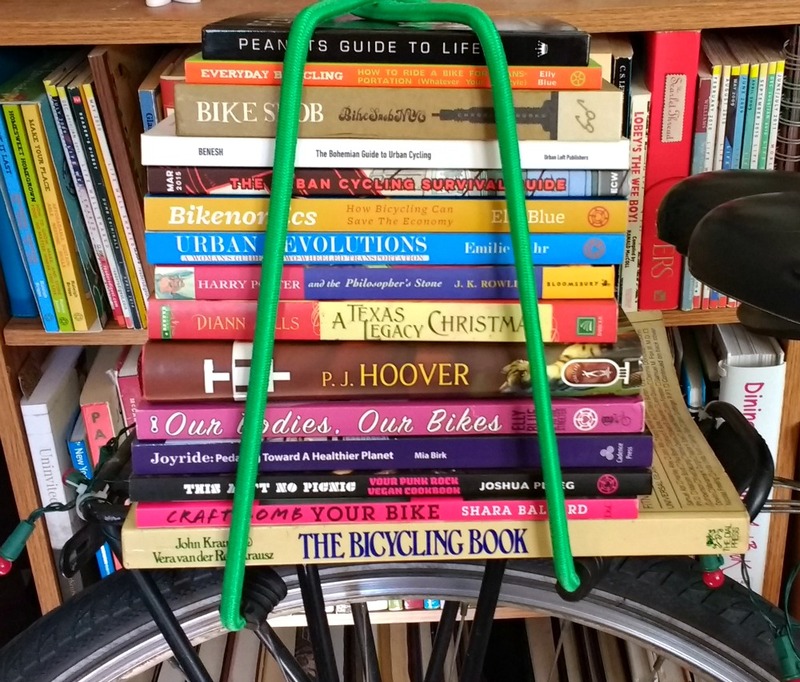 Get a good book and support bicycle advocacy! The title poem is the only one that’s bike related, but as a parody on Emily Dickinson’s slightly more famous work, it’s top-notch. If you’d like to introduce your kids to some classic poetry without them knowing it, or need some new bedtime reading material, or just enjoy poetry yourself, it’s a winner. Wish your place of worship were more bike-friendly? Get some great ideas here. Also by Sean Benesh: The Bohemian Guide to Urban Cycling, which is a fun look at city riding. A real look at our transportation costs and how bikes can help create healthier humans, boost local economies, and foster a sense of community. Also by Elly Blue: Everyday Bicycling (link is to Microcosm Publishing), a short and very sweet how-to guide for beginning riders. Ms. Blue has come through Texas a few times in recent years with the Dinner and Bikes tour, including a fun-filled 2015 stop at the BikeTexas headquarters in Austin. This is an academic research book, so it does not read like a novel. However, it is a gem that is chock-full of key information to take to your city officials, and as such is a must-have reference for advocates. Dr. Pucher was the speaker at our Shifting Gears Lecture Series during the 2013 legislative session. Ride along with Portland’s former bicycle coordinator as she recounts the journey to make Portland one of the best bicycling cities in the U.S. You’ll recognize many of the roadblocks and frustrations that Ms. Burk faced along the way as the same ones that continue to plague advocates across the U.S., and also be inspired at how those roadblocks were turned into mere speed bumps. A great look at the history of who exactly pushed for modern-day roads to be built. (Non-)Spoiler alert: it was people who ride bikes! The interactive version is especially great for enjoying all the included photos and tons of historical tidbits that Mr. Reid includes in the book. Former NYC transportation commissioner Janette Sadik-Khan came to work with a mission: Make NYC safer for pedestrians and people who ride bikes. The book chronicles successes, failures, and above all, Ms. Sadik-Khan’s determination to transform her city. Ms. Sadik-Khan stopped in Austin as part of her book tour in 2015. Our own Robin Stallings provided the cover quote for this excellent book that covers all the basics. Not sure how to get started rolling along on two wheels? Ms. Bambrick has boiled it all down for you right here. A short, easy read about the role the bicycle played in the women’s suffrage movement. This book is especially great to read at this time of year–August 18 marks the 97th anniversary of the 19th Amendment, which guaranteed women the right to vote. This is a kid-friendly and kid-oriented book, so don’t waste any time getting to your local library. No kids? Not to worry–it’s a great one for adults, too. Still not enough to fill your shelf? Check out these recommendations from a recent #bikeschool Twitter chat. And chime in on Facebook or Twitter to tell us your favorite bike book that we haven’t read yet!